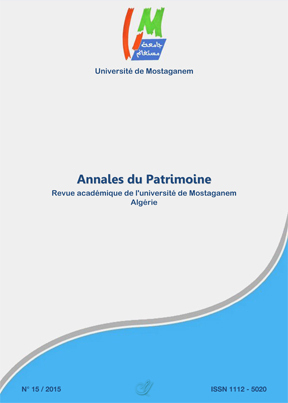 Annales du patrimoine (Annals of Heritage) is a bilingual academic journal published with the participation of researchers in literature, languages and humanities. The journal is devoted to different areas of Algerian and Islamic cultural heritage: literature, language, spirituality, philosophy, art. It appears in French and Arabic once a year and distributed exclusively online. A scientific committee evaluates articles submitted to the editors. The review includes a thematic renewed each number and variable items.